I've been umming & ahhing whether to post this or not as believe it or not I am a pretty private person in general, but hey, what the heck. Why not? Caring is sharing right? In my first pregnancy I experienced implantation bleeding which this time round I didn't have which made me think that I wasn't pregnant. This time however I was feeling stretching, odd pains and cramps like my period was due any time soon...but of course it never materialised on the day I was due. I needed the toilet more than usual, waking frequently in the night. I was waking up in sweats. I was on holiday and prior to this I had undertaken a healthy eating and exercise programme so I was a bit disappointed to find that my tummy still looked a bit full and rounded. This was absolutely not due to the fact it was an all inclusive resort and I was eating loads, oh no! On my return from the holiday, unbeknown to me, I was actually 5 weeks pregnant. I had an odd feeling on the plane home, my back hurt & I was overheating. I HAD to get off the plane as soon as I could. We had an early morning flight and arrived home around 5am - last year when we did this I stayed awake and carried on as usual. This year I went to bed and stayed there for most of the day! I felt a bit nauseous. Scents were getting up my nose, my husband wanted to buy an aftershave at Duty Free - things I had previously liked smelt horrid! Oops! 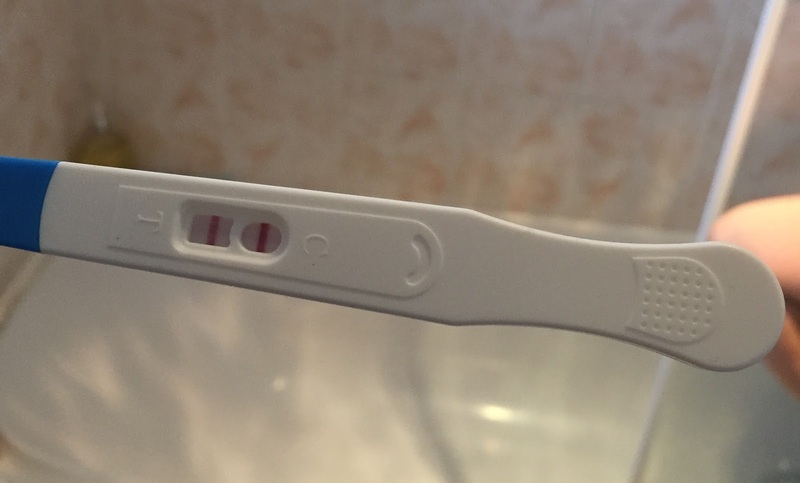 I really wanted one of those Clearblue pregnancy tests that says 'pregnant' but all my husband could find in the supermarket was the tests that have the lines, no matter though... the result was unmistakeable - I was pregnant! Again, I am going to be completely honest, it hasn't been a walk in the park. Now I think my experience is not too common but I think people should be aware that it can happen to you. Of course you can be one of the lucky ones who have no symptoms, or you may have a bit of mild morning sickness or nausea but be otherwise able to function pretty much as you were before. My story is a bit more severe and left me debilitated for weeks. It seemed I was about to embark on a journey of "hyperemesis gravidarum" - the same condition that the Duchess of Cambridge, Kate Middleton suffered from and meant she had to announce her pregnancy far earlier than she probably wanted to. Within a day or so the hormones really kicked in. I was extremely nauseous and could barely stand up. This then progressed to being sick too many times a day to keep count. I lost interest in food as anything I managed to consume would come right back up, water didn't stay down either. Ginger Biscuits - they make me feel sick! but my feelings were off the scale and NOTHING worked. I knew it was so much more than just the odd bit of morning sickness. In desperation I visited my Doctor. Now I really, really didn't want to take anything early on in the pregnancy but frankly I had little choice. I was extremely poorly and not functioning as a human being. My jaw hurt from being sick, my throat hurt from the force of the vomit and I spent most of the day in bed. My throat was irritated so much I would see blood in the sick bowl and was left extremely sore. My stomach would literally be throwing food out and the retching was unbearable. I was given some anti sickness tablets. They didn't stop me being sick altogether but reduced the frequency (down from every half an hour to 5 or 6 times a day) and I could at least keep a bit of water down. On top of this I was told I also had a urine infection (common in pregnancy) and had to take two sets of antibiotics. Headaches - The headaches due to dehydration were horrendous. DO NOT MENTION SCENTS and FRAGRANCES - every scent made me feel ten times worse... I hated my husband's shower gel, aftershave, our handwash.. food, dinner cooking. Anything really! It was all too much. It was the Summer holidays and my poor boy was missing his usual happy mummy. Luckily I had family who could help and look after him as I was in no state to. I narrowly avoided being taken into hospital and put on a drip for dehydration. I felt like I couldn't go..
You see at the end of August my one and only little sister was getting married and I didn't want to miss it for the world, call me crazy but I was not going to miss it. I still don't know how I got through the fabulous day having spent 4 weeks in bed! But I did and it was an amazing day. HG is a lonely illness, it can leave you feeling isolated and affects you mentally as well as physically. I am trying to get some normality back into my life and I am actually seeing people again. I do the school run - sick before I go, sick when I get back..All day nausea and sick most evenings. September has also included my 12 week scan - the one where I came clean and finally confessed to friends & family that I am indeed expecting. My husband came with me to the scan, we marvelled at this little person inside my tummy. Wriggling around and jumping about, I know! All 6.5cm of it!! Baby at first didn't want to play ball... it was standing on his head when we arrived at the hospital but a walk later and plenty of water to drink and it was in the right position for measuring. As I am writing I am 15 weeks tomorrow - still feeling nauseous, still being sick but nowhere near as bad as I was and still exhausted. Yesterday I had my first cup of tea since mid of July. I am eating food far better now, especially lovely, healthy fruit & veg that I loved so much before pregnancy... Onwards & Upwards. Congratulations, you have my complete sympathy. I had HG with both my pregnancies, with my son I just threw up a lot but with my daughter it was like constant seasickness. Only thing that sorted it in the end was seeing a homeopath. I'd tried all the drugs! Hopefully yours will recede now, mine lasted for 8 months!